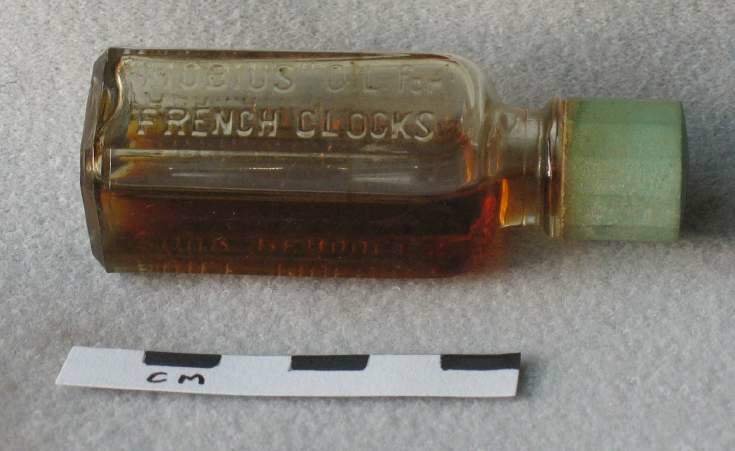 Square bottle of clock oil with green plastic screw top. The top is marked MOEBIUS Since 1855 Swiss Made and has the date 24/5/61 scratched on it. The bottle is stamped HUILE MOEBIUS POUR PENDULES/FABRICATION SUISSE MADE IN SWITZERLAND/MOEBIUS OIL for FRENCH CLOCKS.